Seat angle is not an adjustment that is possible on the more basic wheelchairs but there is often the option of adjusting the seat angle on the height adjustable wheelchairs. On the sports wheelchairs the seat angle is usually referred to as the "dump" and it is measured by how much lower the rear of the seat is than the front of the seat. A seat that is 2" lower at the back than the front would be said to have a 2" dump. While seat angles are usually adjusted to be a bit lower at the back than at the front there is a small portion of the wheelchair population who would benefit from a bit of a tilt forward. When the wheelchair seat is tilted back the user will find sitting for longer periods of time more comfortable, they are less likely to slide forward in their seat, they will find it a bit easier to keep their head upright and more likely to be seated properly with the hips right to the back of the seat when transferring into the wheelchair. On the other hand when the seat angle is tilted back the user will have more trouble transferring out of the wheelchair when attempting a standing transfer and, if they use their feet to propel the wheelchair, will find it more difficult to get a good grip on the floor with their feet when trying to pull themselves along. When the wheelchair seat is tilted forward the user will find it easier to transfer into and out of the wheelchair by doing a standing transfer and will find it easier to get a good grip on the floor when foot propelling. When foot propelling the user will tend to slide forward in the seat so it's recommended that some sort of positioning aid (usually a seat belt) is used to keep them properly seated. A wheelchair with a forward seat tilt will be less comfortable to sit in for long periods of time, will cause the user to slide forward in their seat, cause shearing (stress on the skin on the user's bottom and the backs of their legs) and make the user feel like they are falling forward. Whether some tilt to the seat, either way, and how much, is needed is really a personal decision based on which the user will find more comfortable and functional. For those not capable of balancing the pros and cons of tilting the seat it's recommended that the advice of a professional (wheelchair dealer, OT, PT Doctor, etc.) is acquired. Adjusting the tilt on a wheelchair is a fairly simple procedure of adjusting the mounting posion of the wheels and casters on the frame of the chair. On wheelchairs where seat angle can be adjusted there will be either multiple holes in the rear frame for mounting the rear wheels or adjustable axle plates and multiple holes in the forks for mounting the casters. When the rear wheels are mounted higher on the frame, the rear of the seat will be lower and when the caster are mounted higher on the forks the front of the seat will be higher. 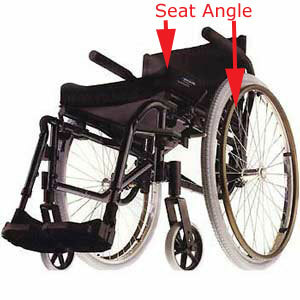 By changing these two features the wheelchair seat angle can be set to various angles. 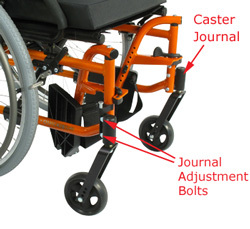 Important - On wheelchairs that allow seat angle adjustment the caster journal will also be adjustable. Onc ethe seat angle is set using the wheel and caster mounting positions the caser journals must be ajusted. If the caster fork stem is not 90 degrees to the ground the wheelchair will not track properly, be harder to roll in a straight line and more difficult to steer. Adjustable caster journals are bolted to the frame and most can be adjusted by loosening and removing the top bolt adjusting the journal and resetting the bolt. Some models of wheelchairs will also have adjustment at the bottom bolt and the adjustment can be done there or with both top and bottom bolt. Checking the csater journal angle can be done with a carpenter's square. When one arm of the square is on the floor, the upright arm of the square will be 90 degrees adn should line up exactly with the cast journal. Using a level on caster journal will not work because because the floor may not be level and the adjustment is not about being level, it's about being 90 degrees to the floor.